Montana became a state November 8, 1889, the 41st state admitted to the Union. In 1864, a group of discouraged prospectors explored one last gulch. That gulch, named “Last Chance” eventually produced more than $20 million in gold. The town that grew there was renamed Helena (HELL-en-a), after a city in Minnesota. Tour that gulch today from the Last Chance Tour Train; board near the capitol. 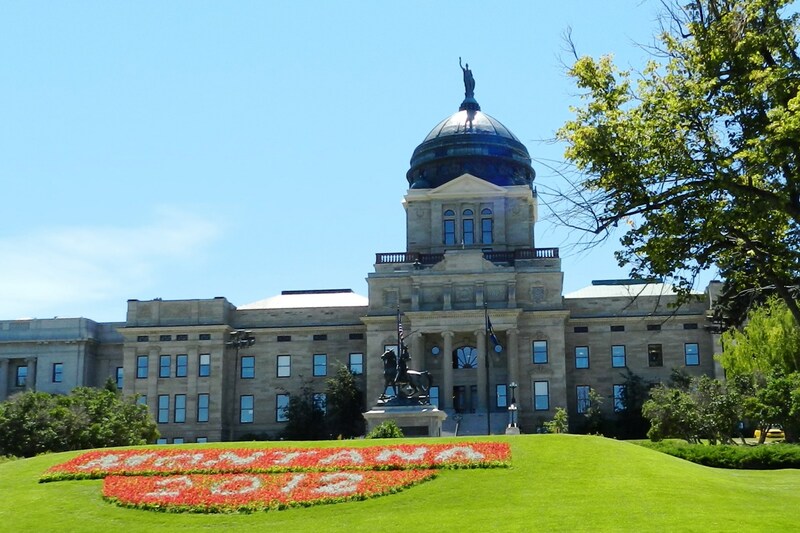 The capitol is faced with Montana granite and topped with a copper dome. Inside are murals by Charles M Russell; a larger collection of his work is next door in the Historical Society Museum. Reeder’s Alley, once home to miners, muleskinners, and Chinese laundry workers is today filled with shops and restaurants. The Cathedral of St Helena, a Gothic building with 230-foot spires has 68 stained-glass windows from Germany. The Gates of the Mountains Missouri River cruise explores territory once traveled by Lewis and Clark. The mountain called the Sleeping Giant, the thoughtfulness behind the signs in town that help folks find their way, the fun of the city tour on the little train and the bumps of the wagon ride out to the ranch, the art, the humor, and most of all, the charm. Mountains near: Rocky Mountains, Continental Divide. Granite Peak, in the south central part of the state near Yellowstone National Park, is the highest point in Montana at 12,789 feet.